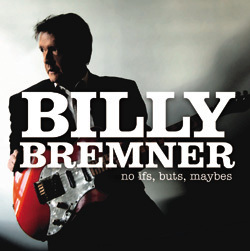 Billy Bremner "No Ifs, Buts, Maybes"
Known for his place with Dave Edmunds and Nick Lowe in ROCKPILE and as a sideman for the Pretenders (doing all the guitars on “Back in the Chain Gang” and “My City Was Gone”), Paul McCartney, and many others, Bremner is one of those guitar legends heard on the radio daily. “No Ifs, Buts, Maybes” rocks out with the best of his ROCKPILE efforts, and is sure to please fans of that group. Born and raised in Scotland, Bremner was noticed quickly for his guitar prowess as the British pub-rock scene exploded in the '70s. His relationship with Dave Edmunds and Nick Lowe resulted in a number of musical and songwriting contributions to their solo albums but only the one "official" Rockpile album: the now-legendary "Seconds of Pleasure" (CBS, 1980), which featured Bremner on lead vocals on two cuts. Bremner’s previous solo efforts are “Bash!,” recorded and released in the mid-’80s, and “A Good Week’s Work,” recorded and released in the late ‘90s.